On 20-22 September 2017 the third training for young civil servants from ministries and departments involved in water governance in Central Asia and Afghanistan took place in Almaty, Kazakhstan. 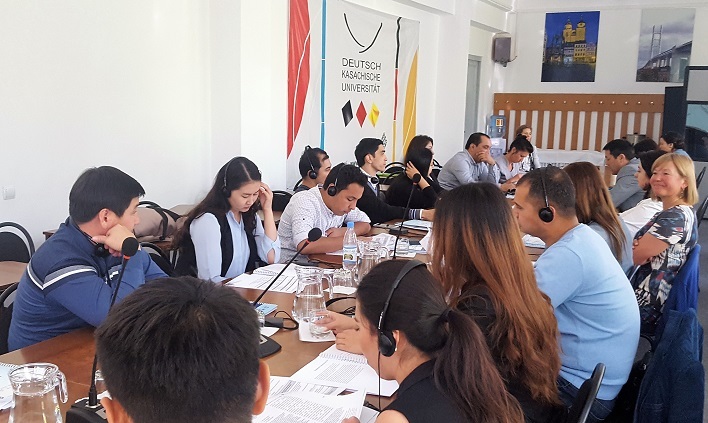 The event was organized by UNESCO Chair in water resources management based at German-Kazakh University, with the support of UNESCO International Hydrological Programme (IHP), UNESCO Almaty Cluster Office and other regional and international partners. UNESCO IHP provided its support in the framework of the Project “Governance of Groundwater Resources in Transboundary Aquifers” (GGRETA), funded by the Swiss Agency for Development and Cooperation and implemented by UNESCO. The three-day training programme included a number of thematic sessions during which lectures on national and international water law and regional water cooperation in Central Asia were delivered to the participants. The training was facilitated by UNESCO expert and Executive Chairman of the International Association for Water Law (AIDA), Mr Stefano Burchi. 12 young civil servants from five Central Asian countries and Afghanistan were trained during the event. The main objective of the training was to improve knowledge and skills of young specialists, as well as to promote cooperation among the representatives of water-related ministries and agencies from Central Asia and Afghanistan. The above activity contributed to the SDG 6 on ensuring availability and sustainable management of water and sanitation for all.